When it comes to automobiles, everyone knows your safety comes first so keep your car in good working order! Keep it safe and save some money off with this free Jiffy Lube Oil Change Coupon! 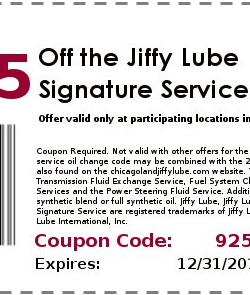 You can get a discount of $9.25 off the Jiffy Lube Signature Service Oil change! Keep your car well maintained, get it to the shop and enjoy using this coupon available from Jiffy Lube.